The Platinum Comedy Series once again delivers another comic genius to its highly entertaining series of stand-up comedians with Dave Chappelle being in the spotlight. For those that are unfamiliar with the works of Dave Chappelle, he recently appeared on Monday nites on SBS in a show entitled "The Chappelle Show" that was one of the most funniest and controversial series to ever grace free to air television in Australia. Apart from his own popular series, Chappelle also starred in movies such as "The Nutty Professor", "Con Air" and "Undercover Brother" to name a few of the movies that he guest starred in. 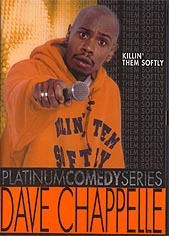 Before making it as an actor and a comedian in the United States, Chappelle originally started off as a stand-up comedian and this DVD focuses on one of his packed out performances called Killing Me Softly. Chappelle talks about a variety of topics that include racism, terrorism, Sesame Street, women and the United States government in some of the funniest stand-up that I have seen in a long time. Some of the memorable segments of this DVD include Chappelle stating that Sesame Street is a bad influence on children as they ignore the homeless (Grover) and the cookie monster is really a "crack-head" with the count, the resident pimp of Sesame Street. Another funny segment is Chappelle talking about his trip to the bronx one night and how he saw a baby standing in the middle of the street at 3am in order to sell weed. Chappelle also saw a woman giving birth to a baby in a niteclub who thought that was the most disgusting thing he has ever seen. Nothing is sacred to this comic genius as Chappelle also targets the white police force, how women magazines decrease female self-esteem and what men really want! The video quality of Dave Chappelle is presented in an aspect ratio of 4:3.1 as it was originally aired on HBO in America and is quite clear and sharp. The audio quality of the disc is nothing special and is presented in Dolby Digital 5.1 simulated surround sound that doesn't sound too great because it was filmed at a live performance because sometimes the sound drops a level but it's nothing to get worried about. There are no extras contained on this DVD whatsoever apart from the previews of other comedians. The Platinum Comedy Series featuring Dave Chappelle's Killing Me Softly tour is a very entertaining watch that features one of the TV's funniest stand-up comedians. If you love political incorrect humour or Dave Chappelle, than this DVD is for you!